Cold, snowy Saturdays were just made for brunch. London was a couple of inches deep in snow at the weekend, and frankly, cereal just wouldn’t cut it that day. So me and M bundled up, braved the icy roads, and went to All Bar One for Breakfast/ Brunch in Canary Wharf. Only ever been for cocktails at all bar one, I didn’t realise it also was a sort of tapas bar- I spy my next evening meal haunt. 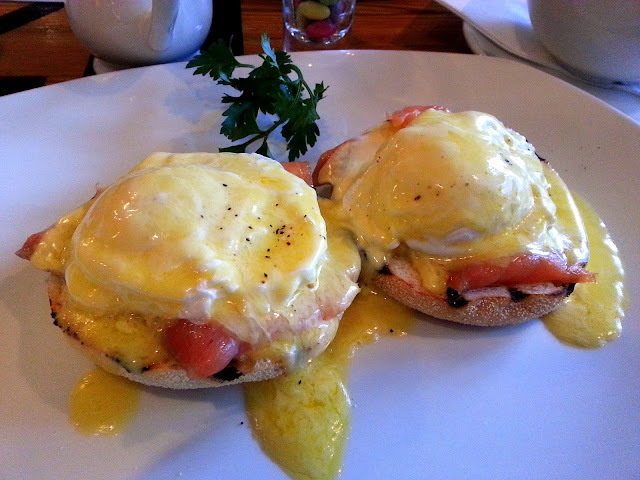 However, this time called for Eggs and what better than Eggs Royale. In case you are wondering, Eggs Royale is the smoked Salmon version of Eggs Benedict. I will admit the sauce was a little too bland for my taste, but the poached eggs were perfect with a lovely runny centre. After refueling, we headed to one of London’s great treats. Exhibition road. Exhibition road houses London’s best and biggest museums. I've been too all of them now, but I could go again and again, especially the V&A, however with male company present we went to the Science Museum. One of my favourite exhibitions was the Challenge of Materials gallery. I also loved all the automobiles. Sorry about the blurry photo- blame M. Just can’t get the staff these days! After we had seen enough, it was just about time for me to catch my train and leave London. It was fantastic to see my friend, and my other bestie- London! Ah I love the V&A and the Science Musuem! Your Eggs Royale look so good, although I'm more a fan of Benedict myself! I love the vivienne westwood you spotted! Ahh love the science museum (secret nerd alerts!) As everyone did we had lots of snow in Surrey, so I made time to do all the little things I never get chance to do. For example, bake cupcakes, reading, helping my parents YOU get the gist. Maybe I shall try London next time, if the trains are okay! What an amazing museum and the photos are absolutely stunning.